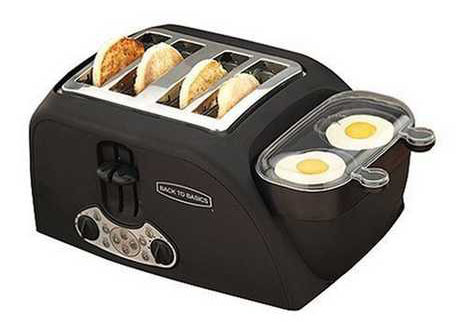 Egg & Muffin Toaster Part Of This Balanced Breakfast | OhGizmo! My friends, it’s time for toasters to move beyond sliced bread, and take their rightful place as the doitall kitchen appliances of the 21st century. A noble first step has been taken by the TEM4500 Egg & Muffin Toaster, which can, in a mere four minutes, poach or boil two eggs to perfection while simultaneously toasting 4 slices of bread, bagels, English muffins, crumpets, or whatever else you can fit into the Extra Wide, Variable Toasting slots. It’s currently about $60 from Amazon, or you can pick up the TEM500 (2 toaster slots, 1 egg) for (appropriately enough) about half that. All hail the egg and muffin toaster! I have the two toaster slot, 1 egg version that I got from target over a year and a half ago. It was red tagged for 15 bucks!!! One of my proudest purchases. I love it. There’s even a place where you can add some canadian bacon or a pre-cooked sausage patty in there and use the steam from the cooking egg to heat them up.